Home Blog Why is Whiplash So Dangerous? Whiplash is the most common injury suffered in non-fatal car accidents and its potential seriousness is often overlooked. Many people who experience what at first seems to be a minor whiplash injury may be unaware that serious side effects may not appear immediately and can continue long term. A delay in medical evaluation of a potential whiplash can jeopardize the legal rights of the victim. When filing an insurance claim or bringing a civil lawsuit for damages, early medical evaluation and thorough documentation are important. Whiplash is a soft tissue injury that most people associate with rear-end collisions. They are also commonly the result of sports injuries and physical altercations. Whiplash is a quick and forceful back and forth jerking movement, first backward and then forward, which injures the joints, muscles, and ligaments in the neck as well as in the upper back. It is important not to underestimate the impact of a whiplash injury. It can cause far more than just a stiff neck, sometimes leading to a traumatic brain injury or paralysis. Because of the potentially severe effects, whiplash should be diagnosed by a doctor, who may decide that an x-ray, CT scan, or MRI is necessary to rule out broken bones, herniated discs, or other possible injuries to the neck area. Anyone who experiences an accident like a rear-end collision should be on the lookout for signs like neck pain and stiffness. Some of the other symptoms of whiplash include a headache, loss in range of motion, dizziness, and even ringing in the ears, blurred vision, irritability, trouble concentrating, and depression. The pain and other symptoms of whiplash can start immediately after the accident. However, it is also possible for the symptoms to not surface for days, weeks, or even months after. Since an accident victim may not feel the pain of a whiplash immediately, it is always a good idea to seek a medical evaluation as soon as possible after an event that causes a whiplash-type neck motion. In mild cases, whiplash resolves within a couple months. In more severe cases, it can remain a chronic condition. 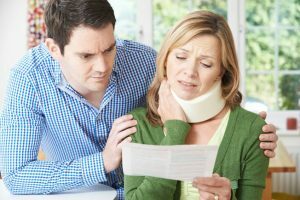 Understanding this going into a personal injury claim is important because it will affect the cost of medical care and determination of factors like pain and suffering. If you have experienced whiplash in an auto or other accident, it is important to know about your legal rights. These kinds of claims are barred if they are not filed within the statute of limitations. A personal injury lawyer will help you protect your rights while seeking fair compensation for your injuries. The attorneys at Ellis Law are experts in California personal injury claims. We take a personal and fact-specific approach to prove each element of your case. Please call us at 310-641-3335 to speak with an Ellis Law attorney and receive a free case evaluation.